The Coffin Dolls line just got super-sized! 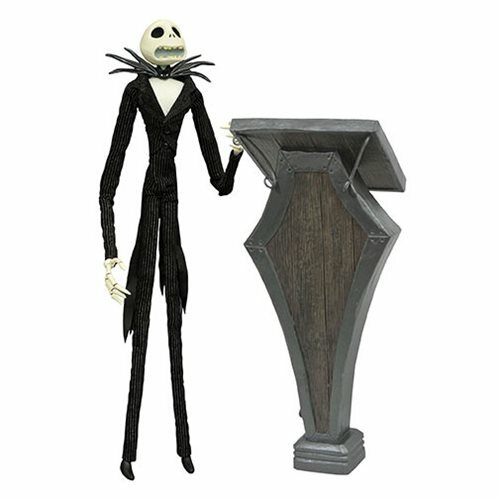 Celebrate the 25th anniversary of The Nightmare Before Christmas with this Podium Jack Skellington Deluxe Coffin Doll that features updated facial expressions and accessories. Jack comes with a podium and he stands in 14-inch scale with real cloth costume and multiple points of articulation, looking like it just stepped off the big screen! The Nightmare Before Christmas Podium Jack Skellington Deluxe Coffin Doll comes packaged in an oversized coffin-shaped window box.